The first disciples of Christ were only later called Christians. Just so with those who were influenced by Martin Luther, John Calvin and Ulrich Zwingli. Only later were they called Protestants. The exact origin of the term protestant is unsure. It may come either from French protestant or German Protestant. What is certain is that both the French and German use of this word was derived from the Latin: protestantem. This Latin word literally meant “one who publicly declares/protests.” I believe the best way to celebrate the Protestant Reformation (October is the “unofficial birthday”) is to regain this idea of “one who declares.” Let me explain. Over time the term Protestant was eventually used to describe all groups protesting Roman Catholicism. Since that time, the term Protestant has been used in many different senses, often as a general term merely to signify non-Catholics who belong to neither of the Churches of Catholic tradition or the churches of the Christian East (Orthodoxy). This use still has a place, at least for historical reasons, but as the world is getting “smaller and smaller” these words will likely mean something very different over time. It is profoundly wrong to think that the Protestant Reformation were merely about the obvious abuses in practice that gripped the Catholic Church in the early 1500s. These abuses had been protested by faithful Catholics for more than a century. And these abuses were, in many instances, corrected a few decades after the Reformation began. Rodney Stark even goes so far as to suggest, rightly I believe, that one of the greatest consequences of the Reformation was that it pushed the Catholic Church into global mission. But what about the Reformation? What marked it the most profoundly was a “fresh reading of the Bible.” It was not a wholly original movement. Reformers had arisen before but never had their ideas caught on with so many people and church leaders. At its most profound level the Reformation criticized the Catholic import of tradition into the gospel. This challenge owed a great deal to humanism, which allowed the Reformers (and eventually Catholic biblical scholars) to “return” to the original sources and primary documents–namely the Scripture in Greek and Hebrew and secondarily the writings of the church fathers in Latin and Greek. Luther believed man was made right with God (justification) not by human works but rather by faith in the gospel of Christ alone. Our righteousness is thus external, meaning we can never attain right standing with God based on anything inside of us. We can only accept it as a pure gift in Christ. God accomplishes, in the gospel, what he commands. Our role is to believe and respond to his grace.This faith is not a work; it is a gift of God, awakened in us by the Holy Spirit. Because of this belief Protestantism developed a new understanding of faith. Faith is not primarily assent to the church or its dogma but personal belief in the living Christ. It is a personal bond of trust created by the Spirit. This view of faith is increasingly understood down to the present day as the work of the Spirit makes it evident, to Christians of all traditions and backgrounds who believe on the Son of God as their Savior and Lord. Tragically Protestantism was forced to break away from the Catholic Church. This break was prompted by serious mistakes on every side. There seems to be little that can be done to “officially” restore these two vast broken communions. For starters, Protestantism divided itself into many state and regional churches and the result was the rise of denominations, sects and even cults. Catholicism, slow to reform itself at times, remains united yet within her communion there are vast differences and distinctions in practical reality. Union may be an ultimate goal but I do not believe union is the actual goal Jesus prayed for in John 17:20–24. What he prayed we would realize is unity in the triune God; Father, Son and Spirit. We can, therefore, embrace the central message of the Reformation on a day like today and at the same time work and pray for unity among all who profess the Lordship of Jesus in the biblical and ancient confessional texts. 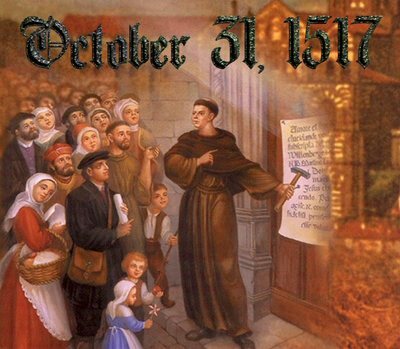 We can, in other words, celebrate the Reformation while we regret the deep divisions it brought about. The recovery of the gospel was God’s work. The divisions, so far as I understand, were the fault of churches and leaders. The Reformation should be celebrated in the spirit of the original word: “One who declares.” We Protestants should not boast, except in the gospel and in Christ alone. We should not boast because of divisions on this day but because of the recovery of the gospel and the ancient sources of Christian faith. We should then repent humbly of whatever we have done to cause new divisions and seek peace with all men, especially those who live in the household of faith.